"Toronto producer Sandro Perri, aka Polmo Polpo, who blends deep, murky techno with rich layers of feedback and densely orchestrated melodies. 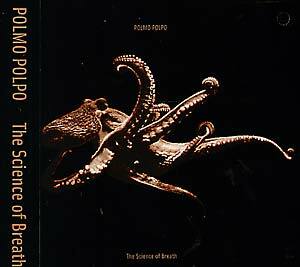 Trying to describe the sound of Polmo Polpo is not an easy task. The marriage of deep rhythms with shifting waves of melody and sometimes brutal white noise is certainly not a commonly used formula. This music is beyond catchy, the sound of the slide guitar shifting in and out of Gas-style minimalism gives the music a driving force that so much of the genre lacks. Over the last few years Polmo Polpo has released four separate 12" EPs on his own imprint Audi Sesna, all of which have gone on to sell out overseas rather quickly. The Science of Breath includes four beat-based tracks from the latest two of these EPs, as well as four new shorter tracks that bring the entire record together, and tread the grounds of sound sculptors like Fennesz and Tim Hecker. This comparison is made mainly on the basis of natural and processed guitar sounds interspersed amongst ambient movements, giving one the feeling of exploring the ocean floor inside a pressurized echo chamber. Heavily layered cello and lap steel guitar combine their colours to create a world of ghostly shadows immersed in the throbbing pulse of 'dance music'."